Your Gateway To China Study Chinese Language while You Are In the China. Admissions From A Well Known Government University In China. Minimum Requirement :- GCE A/L or O/L Duration :- 6 Months / 1 Year Course Fee :- 6 Months Course ----> 2 Lakhs , 1 Year Course-------> 4 Lakhs # Pay After Visa # Part Time Jobs Processing Time : 1 month Registrations are open at OEIC. 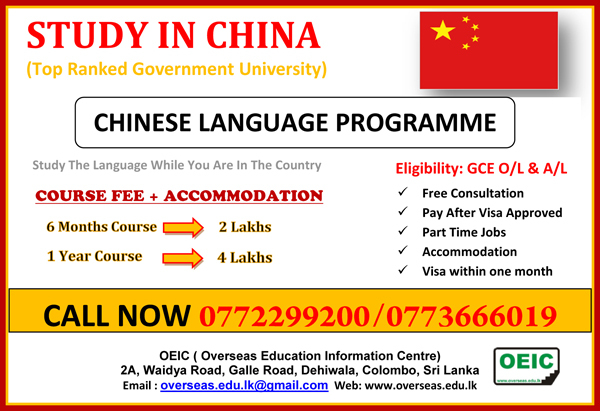 Call 0772299200/0773666019 Visit OEIC,2A,Waidya Road,Dehiwala,Colombo,Sri Lanka. WWW.OVERSEAS.LK Overseas.edu.lk@gmail.com Register Before You Are Too Late!